What referrer data are search engines sending to a HTTP website? Do you see sudden and massive spikes in direct traffic? Direct traffic is that Google Analytics session (or visit) which starts without a referrer being passed by a user’s web browser. This is the most accurate definition of direct traffic. All other definitions of direct traffic (like: direct traffic is a traffic which comes from bookmarks or traffic from typed URLs etc) are lame, as they do not accurately describe, what direct traffic really is. Majority of people assume that the 100% of direct traffic is made up of the traffic which directly visit their website (by typing the URL in the browser address bar) or which comes from bookmarks. But this is not often the case. Whenever Google Analytics is not able to determine the origin of the traffic source, it reports that traffic as direct traffic. Whenever a referrer is not passed or is dropped because of technical reasons, Google Analytics is not able to determine the origin of the traffic source and report that traffic as direct traffic. Google should seriously consider renaming ‘direct traffic’ as ‘unknown’ traffic to avoid any confusion regarding the origin of the traffic source. Sometimes people try to visit your website by typing your brand name followed by .com in the address bar under the assumption that this will be your website address. If they succeed in visiting your website, all such traffic is reported as direct traffic by Google Analytics. Let us suppose a user landed on your web page via Google organic search and then bookmarked the page. After 6 months, the user returned to your web page via the bookmark. His visit could now be reported as direct visit by GA (as by default the campaign cookie expire after 6 months). Note: If the user landed on your web page via Google organic search, bookmarked the page and then later returned to the page, within 6 months via bookmark, then his visit could have been reported as visit from organic search and not direct. This is because by default campaign cookie expires after 6 months. Majority of mobile, desktop and social media applications do not send a referrer. So traffic from such apps is reported as direct traffic by Google Analytics. Non web documents (Microsoft Word, Excel, PowerPoint, PDF etc) do not send a referrer. So traffic from such documents is reported as direct traffic by Google Analytics. Visits that came from a link within a desktop email clients (like Microsoft Outlook) are all reported as direct visits by Google Analytics. IM visits that came from a link within an instant messenger (like Skype, Google Hangout) and/or online chat rooms are all reported as direct traffic by Google Analytics. Incorrectly tagged marketing campaigns can cause the referrer data to drop. 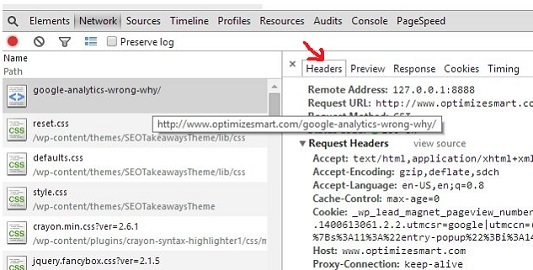 Google analytics ignore the referrer when it sees a campaign tracking code. For example, if you share a tagged link on twitter with ‘utm_source=facebook’, then all the twitter visits will be treated as ‘facebook visits’ by Google Analytics. But if you went one step further and used something like ‘utmSource=facebook’ (which is not the correct campaign tracking variable) while tagging the URL then Google Analytics will completely ignore the referrer and report traffic from twitter as direct traffic. Sending of the referrer data depends entirely on the web browser and/or the redirect method being used. If a user’s web browser does not pass the referrer data then there is no way to get it. Sometimes a user’s browser privacy settings and/or add-ons used (like Firefox No Referrer Add on, ScriptSafe for Chrome) can cause the referrer header to drop and not passed. 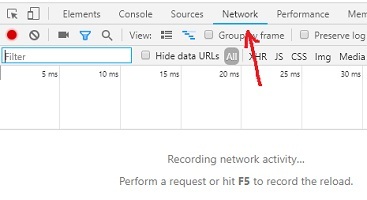 Private browsing, incognito mode, in private browsing and other similar settings do not let the browser to pass the referrer data. Here one thing worth noting is that, Privacy settings and add-ons can not stop search engines like Google to send referrer data because they do not send original referrer header in the first place. That is why they are also able to bypass the HTTP secure connection protocol and can pass referrer from HTTPS to HTTP website. You can also use the same tactic to pass referrer data. Sending of the referrer data depends a lot on the redirect method being used. Give preference to 301 over 302 wherever you can, as 301 redirects have better cross browser compatibility when it comes to passing the referrer data. 302 redirect often cause the referrer to be dropped. 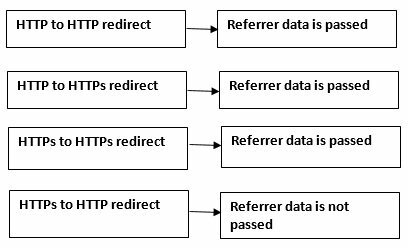 During HTTPs to HTTP redirect and vice versa, referrer is not passed by default. All such traffic is reported as direct traffic by Google Analytics. When you use an option like ‘open in safari’ or ‘open in chrome’ in IOS, the referrer data is not passed. 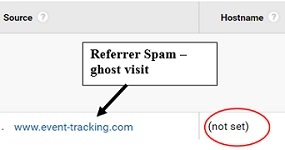 Referrer is not passed in case of visits that came from a link which uses the ‘rel=noreferrer’ attribute. Sometimes your company’s firewall settings can cause the referrer to drop. Note: Sometimes errors in your script can cause the Google Analytics cookies to be reset, thus resulting in a direct visit. A fake hit is the one which is generated by a spam bot instead of as a result of a living breathing human being who interacted with your website. What that means, spammer can send fake direct traffic, fake referral traffic, fake organic traffic, fake traffic from social media etc. Even using the premium version of Google Analytics does not protect your GA account from being hacked/spammed. Spam bots which crawl your website can visit your website without sending referrer data. All such traffic will be reported as direct traffic by Google Analytics. Spam bots which do not visit your website can send fake hits to your GA property by abusing measurement protocol. If you see a sudden and massive spike in direct traffic with a bounce rate close to 100% and an avg. session duration close to 0 second, then most probably your website has been attacked by a spam bot. #2 As a marketing channel. In the context of GA, ‘source’ (or ‘traffic source’) is the origin of your website traffic. In case of ‘(direct) / (none)‘, ‘direct’ is the traffic source. In the context of GA, ‘medium’ (or ‘traffic medium’) is the category of the traffic source as defined by Google. In case of ‘(direct) / (none)‘, ‘none’ is the traffic medium. Whenever a referrer is not passed or is dropped because of technical reasons, Google Analytics is not able to determine the traffic source and the traffic is treated as direct traffic by Google. In that case, GA sets the traffic source to ‘direct’ and medium to ‘none’. In the context of Google Analytics, a channel or a marketing channel is a group of several traffic sources with same medium. For example, ‘Direct’ is a marketing channel which can be made up of any number of traffic sources as long as medium of the traffic sources is ‘none’. In other words, Direct marketing channel can be made up of any number of traffic sources as long as the traffic sources are unknown to Google Analytics. For example, in case of traffic coming from: Microsoft Word document, instant messenger (like Skype) or a mobile app, the referrer is not passed and hence Google Analytics is not able to determine the source of the traffic. Because of that, all such traffic is treated as direct traffic by Google. In order to understand how direct traffic works, you first need to understand the concept of ‘referrer’. In order to understand ‘referrer’ you first need to understand HTTP. So let us first start with HTTP and then we will gradually move to ‘referrer’. HTTP or Hypertext Transfer Protocol is a set of rules used by web browsers and web servers to communicate with each other. A web server communicates back by sending HTTP responses for each HTTP request. Each HTTP request is made up of request line and request headers (also called HTTP request headers). Similarly, each HTTP response is made up of status line and response headers (also called HTTP response headers). This request was made to my web server (where my website is hosted) by a user’s browser when he clicked on a link to one of my blog post (You are doing Google Analytics all wrong. Here is why) from my Google+ page. Now since the request was made to my web server, my server has to communicate back (it has to obey HTTP protocols) to the user’s browser. It does so by sending HTTP response. This response was sent by my web server to the user’s browser. If you want to see these HTTP request and response headers, you just can’t see them by viewing the source code of a web page. You won’t find them there. I use a tool called ‘Chrome Developer Tools’ to see HTTP requests and responses for a particular web page. 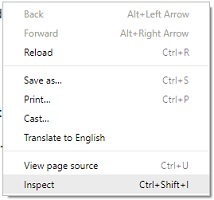 This tool is already built into Google Chrome browser. This will open developers tool window at the bottom of your browser. Step-3: Press F5 to reload your web page. On the right hand side of the developers window, you can see all the HTTP response and request headers. This is the window from which you can find out whether a referrer was passed or not. Note: Cookie is one of the HTTP request header (see the screenshot above). So cookie data is sent via HTTP request to a web server. If your website is on https:// and you are linking out or redirecting to another https:// website, your browser will send referrer data. Similarly, if your website is on http:// and you are linking out or redirecting to a https:// website, your browser will send referrer data. HTTPS or Hypertext Transfer Protocol Secure is simply a secure version of the HTTP. If your website is on https:// and you are linking out or redirecting to a http:// website, your browser will not send referrer data because of security reasons. What that means, all of the HTTP websites you are sending the traffic to, will see traffic from your HTTPS website as direct traffic. However, if your website is on https:// and you are linking out or redirecting to another https:// website, your browser will send referrer data because both websites are using secure connection. So if one day, all search engines, browsers and social networks move to HTTPS (and they will) while your website won’t then you will lose majority of your referrer data for good as HTTPS websites by default, do not pass referrer data to HTTP websites. I used the word ‘default’ because it is possible to send referrer data from a HTTPS website to an HTTP website. As mentioned earlier, you can send referrer data from a HTTPS website to an HTTP website. How they are able to do that? They all use an internal redirect script that first redirects a visitor to a HTTP page (which creates its own referrer data) before sending the visitor to the actual URL on a HTTP website. All of this will happen so fast, that you can’t easily identify that you were first redirected to an intermediate HTTP page. Facebook and twitter follow the same tactic. They create and send their own referrer data instead of the original referrer data. Facebook uses facebook.com/l.php as an intermediate page, whereas twitter uses t.co/ as an intermediate page. Now since these social networks do not send the original referrer data, they can rewrite the referrer data whatever way they want and can hide any information they like. Another advantage of using this tactic is that these social networks can easily hide personally identifiable information and can thus protect users’ privacy. Google Search Engine also use the same tactic as it redirects you through another URL. 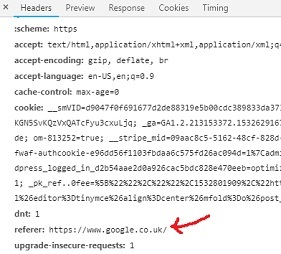 That is why even when being on a secure connection, Google is able to send referrer data to HTTP websites. Since Google doesn’t send you the original referrer data, it can also rewrite the referrer data whatever way it wants and can hide any information it likes. So Google choose to hide the ‘keyword’ data from its referrer via ‘not provided’ keywords. You can use the same tactic to send referrer data from your HTTPS website to any HTTP website. Step-2: Search for a keyword phrase for which your HTTP website rank on the first page of Google and then click on your website listing in the search results. Use the ‘Get Referrer URL chrome extension’ when you navigate from one web page of your website to another. Direct traffic is increasing day by day and if you don’t do anything about it now, then one day all you will see in your analytics reports will be direct traffic: little to no referral data, just direct traffic and your favourite ‘not provided’ keywords. Every major website/browser/search engine is moving to secure connection (https://) while your website is still using http. So what will happen is not so distant future is that you will stop getting referral data. This is because by default HTTPS websites do not send referrer data to HTTP websites. You need to capture as much referral data as possible, if you wish to continue to do meaningful analysis in the distant future. You should move your website to secure connection ASAP even if your website is not e-commerce and you are not collecting any sensitive data. In this way you will be able to track referrals from HTTPS websites which you won’t be able to otherwise. In order to move your website to a secure connection, you would need to get the SSL Certificate for your domain. You can get this certificate for free or you can purchase it. Cloudflare provides free shared SSL certificate for wordpress websites. So you really have no excuse, not to move your website to secure connection. If for some reason, you can not the get the free SSL certificate from Cloudflare, you can purchase it from companies like ‘Comodo‘ or ‘Digicert‘. When you get the SSL certificate, you should migrate your website from HTTP to HTTPS by using 301 redirects. That way you don’t loose organic search traffic. Hire a professional SEO for the migration work unless you know exactly what you are doing. Otherwise you may end up loosing lot of organic search traffic. This message is the proof that your website is on secure connection. For more details about getting the SSL certificate, contact your web host. If you run an affiliate website and your website is on https, you would not want your advertisers (those who are still using HTTP websites) to believe that your website does not send any traffic (as without referrer, traffic will be reported as direct traffic by GA). Hence once you have moved to secure connection, it is very important that you make special efforts to send referrer data to HTTP websites. This is the same reason, why websites like Facebook, Google and Twitter make special efforts to send the referrer data to HTTP websites. If they don’t then their advertisers who are still using HTTP websites will not see any traffic coming from these advertising platforms (as without referrer, incoming traffic will be reported as direct traffic by GA) and may believe that they are losing popularity and hence are not good advertising platform. Make sure that you always tag the URLs you share, via email or social media. As mentioned earlie,r if you share a tagged link on twitter with ‘utm_source=facebook’, then all the twitter visits will be reported as ‘Facebook visits’ by Google Analytics. 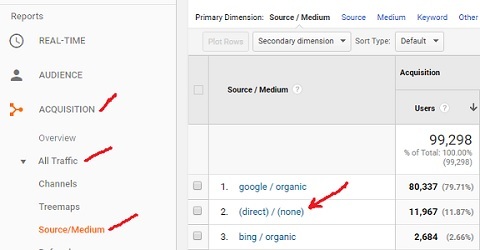 Similarly, if you used incorrect campaign parameters (like UTMSource=facebook) then Google analytics will completely ignore the referrer and treat referral visits as direct visits. 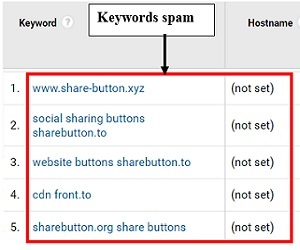 Use Google URL builders to tag campaign URLs correctly. Make sure all the web pages on your website has got valid Google Analytics tracking code which fire on page load. Otherwise traffic from your own web pages can be reported as either direct traffic or self-referral traffic by Google Analytics. For example, consider the following scenario. Then he navigates to the web page (say web page B) which contains valid GA tracking code. 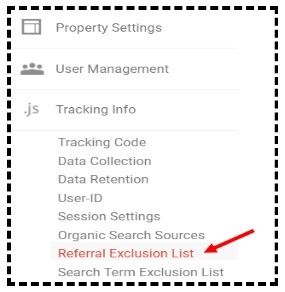 Now if your domain name is in the referral exclusion list than the traffic from Web Page A to Web Page B will be reported as direct traffic by GA. If your domain name is not in the referral exclusion list than the traffic from Web Page A to Web Page B will be reported as self-referral traffic by GA.
You should do a site wide tag audit to identify all web pages with missing GA tracking code. If the URL you embed in a non-html documents (word, excel, powerpoint, PDF etc) or in an email, contains clearly visible campaign tracking parameters then it reduces its chances of being clicked or shared by your target audience. People do not like their activities (like clicking on a link) being tracked. So when they see a URL with campaign tracking parameters they could immediately feel like being tracked. So some people either don’t share such URLs or remove the campaign tracking parameters before they share. Not to mention, the campaign tracking parameters make a URL looks ugly. If you are deploying contents via non-html documents (word, excel, powerpoint, PDF etc) and/or desktop email clients then the best way to embed tagged URLs is through a URL shortening service like bit.ly. From the screenshot above, i can easily understand that someone clicked on a link embedded in microsoft-word document. This is the advantage of tagging URLs in non-HTM documents. Avoid redirect chains, as a referrer may drop during several redirects. Move your website to HTTPS as explained earlier. Make sure there is no rel=”noreferrer” on your website links especially if you are an affiliate. Make sure that your code does not cause Google Analytics cookies to be reset, thus resulting in a direct visit. This is one of the most overlooked issue and often hard to diagnose. Check your company’s firewall settings to make sure that the referrer is not dropped. Block your own company’s traffic (also called internal traffic) from being tracked by Google Analytics by installing Google Analytics Opt-out Add-on. Blocking traffic by IP address does not always work well (unless you are on a static IP) as IP addresses changes all the time. Often internal traffic end up being reported as direct traffic by Google Analytics. For example, if your developers are heavily involved in testing then they are going to visit your website all day, everyday. All such traffic is likely to be reported as direct traffic by Google Analytics. #11. Segment your direct traffic into two categories. The first category includes desktop and tablet direct visits. The second category includes mobile direct visits. 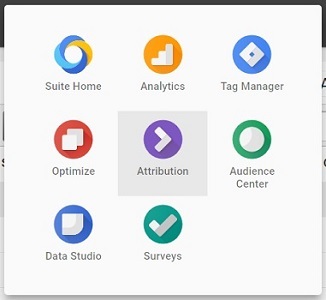 You can create these categories by using custom segments in Google Analytics. This will give you a good idea of what your direct traffic is made up of and how you can minimize it. #12. Look for correlation between your direct visits and marketing campaigns. Often when we launch a new marketing campaign (esp. offline) there is a considerable increase in direct traffic to the website. You need to note down all such changes in direct traffic through Google Analytics Annotations. So that later you can attribute traffic and conversions through direct traffic in a particular time period to your marketing campaigns. If your website has been set up mainly to generate leads through phone calls (quite common in case of websites which sell high priced items like properties, cars, yacht, consultation services etc.) then you will miss out on all the referral data, if you do not implement a phone call tracking solution. Do not just rely on Google Analytics to capture referral data esp. if you are tracking mobile apps. There are lot of third party tools (like Tune) out there which can track referral data much more accurately than Google Analytics. If you are a business which advertises its products or services on TV and you want to measure the impact of TV advertising on website traffic and sales then you should seriously consider using a TV attribution model. TV attribution model is an algorithmic attribution model which uses machine learning and statistical modelling for assigning conversion credit to various marketing touch points. TV ads drive website traffic and sales. If you monitor your GA real time reports during and after a TV ad, you are likely to see a huge uplift in direct traffic. But there is no easy way to prove that the uplift is because of the TV ad and not because of some other marketing activity. If you are running several TV ads on various ad networks then it becomes even more difficult to understand the impact of particular ad network, TV program and ad slot on website traffic and sales. Here TV attribution model tool comes handy. Through TV attribution model tool you can correlate TV ad airing with your website traffic, sales and other online users’ activities in real time. 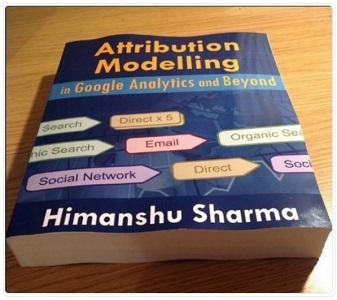 This attribution model is not something which you can create in standard Google Analytics. It is beyond its capabilities. You would need to use a tool which provides TV attribution solutions. 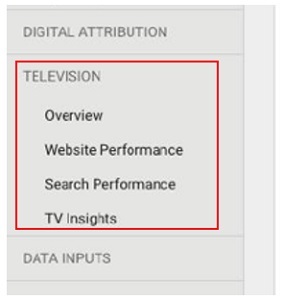 Google Attribution 360 provides a TV attribution model tool with the aim to provide a detailed insight into the relationship between TV ad airings and customer online activities. Be innovative and device new ways to capture referral data. For example, you can capture referral data through lead generation forum, on-page surveys, email surveys, contests etc. Simply ask your website visitors via form, how they found your website/service. Contrary to popular belief, ‘Direct’ traffic is not really a marketing channel. It is a ‘demand’ which is created as a result of investment in marketing campaigns. People will not automatically find your website and visit it directly. They find and visit your website in response to some online and/or offline marketing activity. This marketing activity can also include ‘word of mouth’ publicity. So if majority of your sales and conversions are being attributed to direct traffic, you may get the impression that it is just your brand power which is driving sales and not the marketing campaigns. If you are still in doubt then pause all of your marketing campaigns for a week or two and monitor how it impacts the direct traffic to your website. Your direct traffic is likely to go down. Customers generally do not convert on their very first visit to a website. A return visit is most likely to happen before a conversion or transaction takes place on the website. One of the most common and easiest ways to return to a website is to type part of the website URL in the browser address bar. The web browser then autofills the remaining part of the URL and the user ends up directly visiting your website. Because of this user behavior, direct traffic can end up being attributed a lot of traffic, sales and other conversions by web analytics tools. # Organic traffic is playing a secondary role to direct traffic. # The majority of traffic and revenue is coming through direct traffic. # We need to speed up content development and link building to increase organic traffic to the website. But now you know that all unknown traffic is reported as direct traffic by Google Analytics. So on the surface it looks like 618,199 visits/sessions were direct, but it may actually be only 25,000 sessions which were from direct traffic and the rest were from display ads, email, organic, social media and applications/campaigns in which the referrers were not passed. But this analysis does not end here, because you are still not looking at the complete picture. Visitors do not always access your website directly and then make a purchase straight away. They are generally exposed to multiple acquisition/marketing channels (like display ads, social media, paid search, organic search, referral websites, email etc) before they access your website directly and make a purchase. So if you are unaware of the role played by prior marketing channels, you will credit conversions and e-commerce transactions to the wrong marketing channels, like in the present case to direct traffic. If you look at the chart above, organic search is playing a key role in driving direct traffic to the website which eventually resulted in conversions and ecommerce transactions. 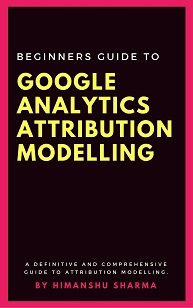 To get this type of understanding you need to understand and implement attribution modelling. So the conclusion that organic traffic is playing a secondary role to direct traffic is incorrect. If that is not the case, then monitor your online and esp. offline marketing activities. May be someone in your company is running ads on TV or Radio which is causing sudden and massive spikes in direct traffic? May be your brand is being mentioned on a popular website or by an influencer with massive social media following? May be someone is running a marketing campaign with incorrect campaign tracking parameters which is resulting in massive amount of direct traffic? Find out all possible reasons of spike in direct traffic. 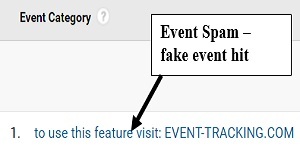 If you exclude the case of fake direct traffic from spam bots, direct traffic does not happen on its own. 1. 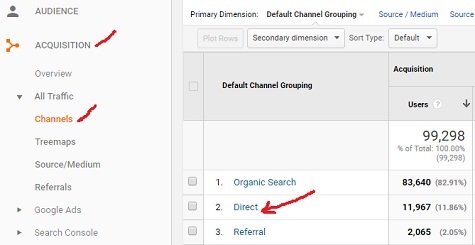 In case of non-multi channel funnel reports in Google Analytics, the conversion is attributed to the previous non-direct campaign/traffic source (if there is one). 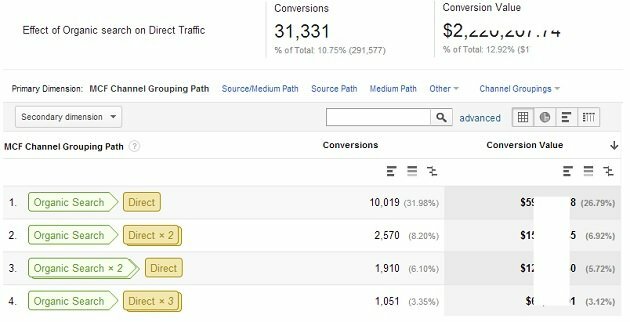 So Google attributes conversions to direct traffic in 2 ways and not just in one way depending upon which type of report you are looking into (multi channel funnel report or non multi channel funnel report). Note: When you are analysing the impact of direct traffic on your business bottom-line, it is wise to look and draw conclusions from the non-multi channel funnel reports rather than the multi channel funnel reports, as non-multi channel funnel reports present true customer buying behavior in case of direct traffic. Direct traffic is a SEO killer. Google Analytics can attribute lot of sales initiated by organic search traffic to direct traffic. By how do you know, whether this is the case in your situation? 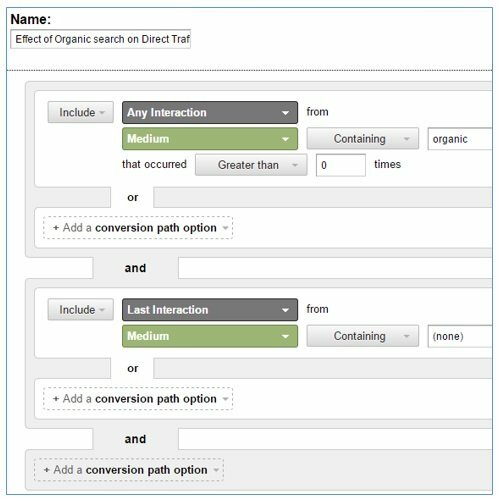 You can measure the impact of organic search traffic on direct traffic by using Google Analytics Conversion Segments. 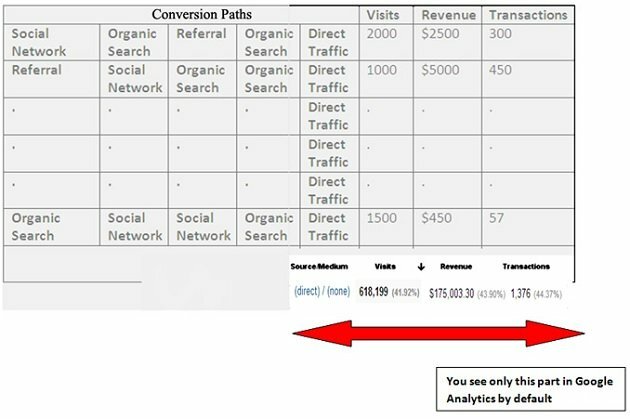 Step-1: Navigate to ‘Top Conversions Path’ Report (under Conversions > ‘Multi Channel Funnel’ Report) in Google Analytics. This conversion segment will tell you how organic traffic is helping direct traffic’s conversions. So this segment is very important. Note how Direct traffic is stealing your SEO efforts. You need to show this report to your client/boss. 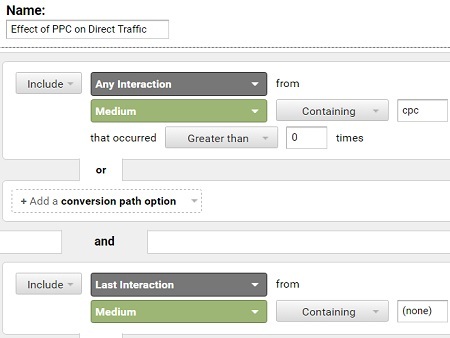 Direct traffic is also a PPC killer. Google Analytics can attribute lot of sales initiated by paid search traffic to direct traffic. Through this segment you can determine how PPC is impacting the conversions through direct traffic. PPC guys will love this conversion segment.